You can add annotations by going to the list of uploaded videos and clicking on "Edit annotations" or by visiting one of your videos while you are logged in. There are three types of annotations that can be added while playing the video: speech bubbles, notes and spotlights, as you can see in the screenshot above. can be transformed into a much more engaging content with clickable annotations that point to other videos. For now, only video creators can add annotations, but it would be nice to allow any user to comment on a specific moment from a video (a la Viddler) or to add funny speech bubbles. The embedded version didn't show any annotations for me but it worked on the youtube site. Yes, I know. That was the point of embedding the video: to show the difference between the original video and the enhanced version with annotations. I'm surprised it can't be done in Google Videos too? Now we need on-screen comments like on Niconico Douga? Great new option. Would be even better if you could add links to websites outside YouTube (e.g. deeplinks to products in webshops, lyrics or tabs of songs, links to extended versions that didn't fit in the 10 minute-limit of YouTube...). 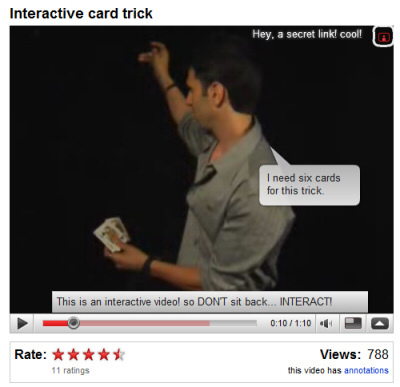 The video annotation could be distracting to the viewers if it is done poorly. No annotations on the embedded videos? That really blows.. There is no point if you can only annotate your own videos. The fun is in annotating others' stuff. That's the whole damn point of all this: interactivity. I can annotate when I create my videos. So, to annotate I have to download a youtube video someone else posted and repost it as my own and then annotate it. You can easy add your subtitles using the editor. Actually there are a lot of video groups that are doing "interactive video." YouTube is just dipping their toes in the water. Check out www.veeple.com. They allow you to not only annotate your videos but also add interactive images from your computer, make any object in your video linkable to any outside website and you can move your spot, your link or annotation around the screen in real-time, link to a MySpace or Facebook page, let others annotate your video, and on and on, pretty cool! They are more of a lab where people can come play than a competitor to YouTube (they have very low traffic) but they are doing some neat interactive stuff. bubbleply.com has a much better annotation tool than youtube that has better functionality and features and works on embeds and let's you do it many languages. I loved this new YouTube feature. I couldnt resist myself to write blog on this. Interesting, and with the video stats YouTube is improving the user experience. These guys came up with a great way to use annotations, and it's hysterical too. My god those annotation are annoying. They should be disabled BY DEFAULT. Not only 99.9% of comments on youtube are just plain retarded, now we get to endure that. I use the annotations all the time but would like to make links that open in new windows available as well. can we add a link to our site from youtube video? i also want to know is there any way to get traffic to our site by youtube videos?? Because I didn't know what it was, I clicked on the screen of a video I uploaded and accidentally put in a temporary box that says 'Enter Text Here'. Now, every time someone watches the video, that comes up and I don't know how to get it off permanently! Anyone have any idea how I can get rid of it? It would be awesome if we could add links to any pages outside YouTube. I truly hate these annotations. I turn them off as soon as they start pooping up... oops I mean popping up. I wish I could disable them ALL FOREVER. on the annotations sorry i really need help!!!!!!!!!!!!!!!!!!!!!!!!!!!!!!!!!!!!!!!!!!!!!!!!!!! I must agree with Kee!! I would love to be able to add an active link on my video that would send to my website or my myspace for exemple. I think they have to add the ability to link to outside, but they don't do it for a reason. I want to put a annotation using youtube options and how do I make it so my annotations stays on the video until its done playing so it doesn't disappear after a few seconds? how do you get rid of an Annotations because i just messed up my video with it? So i re-installed my java and my flash player, i have the latest browser, i have tried Google chrome, IE (internet explorer) and Firefox. And i still fail to be able to watch videos on YouTube, but watching the videos through www.google.com/video works perfectly fine. This tells me that YouTube has massive script problems probably linking to the channel updates not long ago, also i cannot veiws my comments personal message or freind invites. The 'more info' option does not work either. so nice. greatttt! i don`t find them irritating. You Tube annotations are excellent - and also great for making the video more interactive and accessible to others. So if I were to use this on my site, could I make a video review of a Google TV box, for example, and then use this to link to other portions of my website as well? Or do the links have to direct to other youtube videos? Thanks to this, I don't have to add text with WindowsMovieMaker to my video. Would be cool to add hyperlinks in the video as well. It really works. You can add links in your high views videos of your low views videos. Yeah. This is a great example of video annotations. It was made by Time Out and it's a comedy movie quiz! How do I add annotations via YouTube API?